I blinked a couple of times, and somehow it's October. It's true what they say—time travels way too quickly as you age. My next blog post will probably be at age 54 (kidding, I have a few lined up and I promise it won't be long before I post my next recipe). I started writing this post in July when strawberries were in season here in New England, and next thing ya know I'm in the middle of the apple and pear harvest and canning extravaganza, and now leaf raking has presented itself as an alternate full-time job. Somewhere in between I did a ton of gardening (I was thrilled with my veggie garden this year, and actually feel as though I'm getting the hang of it), took a trip to Sun Valley, Idaho with the Man for the total eclipse (it was amazing) and had old friends and family come to visit. And now it's time to hunker down for fall. So while the photo shows strawberries (and if you're in California, strawberries are still available at the farmers market!) feel free to use sliced pear if you live in a place like New England that waved goodbye to berries a while back. I first learned about putting olive oil and sea salt on oatmeal a number of years ago from a behind-the-scenes video blog with Giada De Laurentiis (evidently it's her favorite). I'm not sure why I hadn't conceived of savory oatmeal on my own—cooked oats are no different than brown rice or farro, of which I consume(d) generous helpings with olive oil and sea salt on a regular basis. But somehow oatmeal has been hemmed in as a sweet breakfast option, eaten "properly" only when topped with brown sugar and cream. But such limits are meant to be pushed. 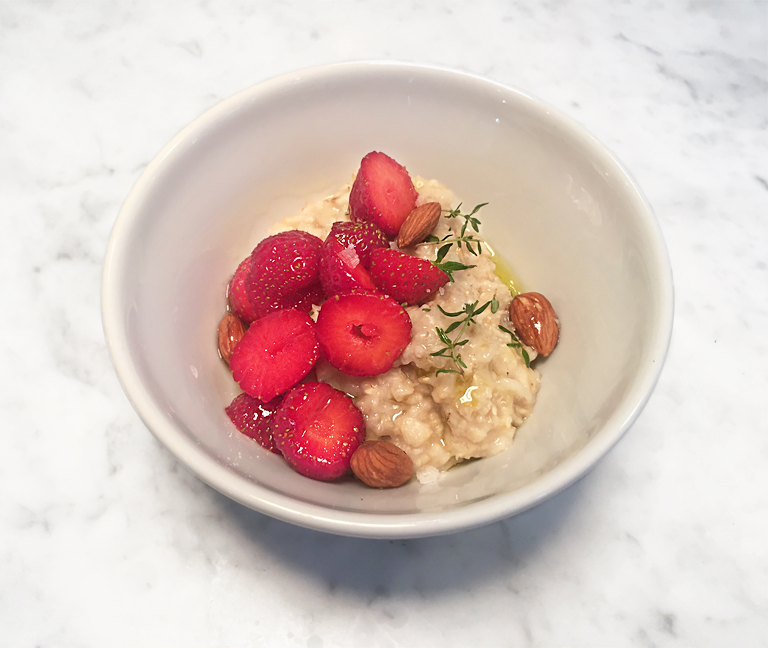 I later found a recipe for "Gladiator Oatmeal" with olive oil, rosemary, bacon and chopped dates—savory, yes, but I'm not going to eat bacon on my oatmeal every day. In a medium saucepan, bring the oats, water and a large pinch of sea salt to a low boil over medium heat. Reduce heat to low, and cook, stirring frequently, until creamy (about 4 minutes). Spoon the oatmeal into 2 bowls, and top with the fruit and nuts. Garnish with a pinch of fresh thyme leaves, and a drizzle of olive oil. Finish with a pinch of flaky sea salt (crush it between your fingers to break up the flakes). It's all about the ingredients. When I make something super simple, good ingredients are more important than ever. Take olive oil for example- if I use olive oil to sauté onions that are going into a soup, the flavor of the oil isn't going to hold a lot of weight once the soup comes together. But if I'm making a simple vinaigrette, the flavor of the oil greatly impacts the taste of the salad. Here's the scoop. I can't digest the protein in cow's milk, but, like many people in the same situation, can digest both sheep and goat milk. Goat milk yogurts are a little risky in my opinion, and I've had some that are downright terrible. While I love the tangy taste of chèvre and other goat cheeses, store-bought goat milk yogurts are often too strong for me. There are definitely exceptions- my mother's friend from the farmers market used to make the most amazing goat yogurt once a year for about a month after the kids are weaned. But since her blackmarket goat yogurt was only available for a short period of time I had to look elsewhere. To the sheep. Much less tang. Creamy. Yum. In California I loved Bellwether Farm's plain sheep milk yogurt. It is made just an hour up the road from my old house, in Sonoma County. I bought it at the San Rafael Farmers Market for $2 per container. It's also available at Whole Foods and a variety of other local places, but I liked my weekly chat at the yogurt booth (plus it's way cheaper!). Back east I eat Old Chatham Sheepherding Company's plain sheep milk yogurt which coincidentally is made about an hour away from my new house, in Old Chatham, New York. Cream at the top. Thicker in texture than the Bellwether. Each different, both delicious. Cow, goat, sheep, buffalo, whatever it may be, the key here is plain. Plain yogurt might seem a little daunting, but when you mix in your own fruit you don't need the added flavor and sweetener. Give it a try, and if it isn't sweet enough once you add the toppings, drizzle a little honey or maple syrup on there. That way you can control the level of sweetness. On to the toppings. As for unsweetened coconut flakes, Bob's Red Mill and Let's Do Organic both provide great products. I like Spectrum a lot, and they make a great ground flax seed. Keep it in your freezer, as the oils can go rancid if it's kept for too long in the pantry. A ton of companies seem to make raw cacao nibs these days, but I most frequently purchase Navitas Naturals out of convenience. I order a lot from Vitacost as you may have noticed from all the Vitacost product links I give with my recipes. They're a great resource for healthful ingredients that are typically expensive, but at a much lower cost. And while I'm all about going to the store, connecting with people etc, it's a really smart and economical way to stock up on the best pantry staples. It's always nice having something on hand to make breakfast a little more special, particularly during the holidays when you might have houseguests to feed but not a whole lot of time. Top creamy greek yogurt (or sheep's milk yogurt, in my case) with some fruit and homemade granola, and you have an easy yet festive breakfast that will stick with you throughout the day. 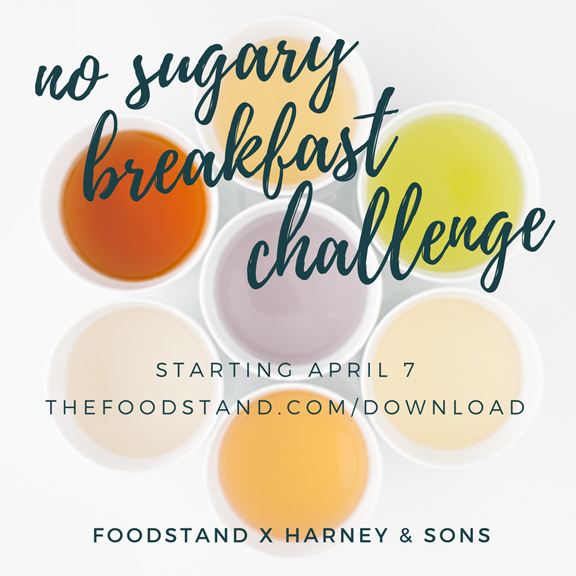 And because the granola keeps wonderfully in an airtight container on the counter (for even longer lasting power, keep it in your freezer) you don't have to sacrifice sleep to serve something homemade for breakfast! Preheat the oven to 300 degrees. Oil two large glass Pyrex baking dishes and set aside. Mix all dry ingredients together in a large bowl. Combine the wet ingredients over very low heat on the stove, or in the microwave until just warm. Pour the wet ingredients into the dry, and stir to thoroughly combine. Distribute between your two baking dishes, and bake for 45-60 minutes until golden, stirring every 15 minutes. Cool in the baking dishes, and store in an airtight container.